Volunteering as a group on a care & community project in the Philippines is a challenging but hugely rewarding experience. Regardless of whether you’re a group from school, some friends from university, a group of work colleagues looking for a fulfilling break or an organisation looking to take your skills further afield, you will have a role to play and your contribution will be valued immensely. Unfortunately many thousands of Filipino children grow up in poverty, often deprived of basic education and healthcare. Rapid growth and urbanisation means that almost half the country's population now live in towns and cities, with the Philippines now being one of the most urbanised countries in Southeast Asia. Our Care & Community projects are based in the city of Bogo on the northern coast of the island of Cebu. 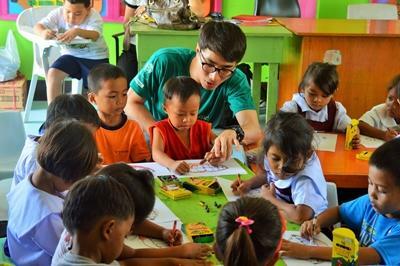 Groups of volunteers are needed to assist the local staff as extra pairs of hands in the day care centres, kindergartens and special education centres. This may involve feeding the children, helping them get ready for the day or teaching them personal hygiene. One of the key things you can offer the children is both friendship and support. Whether your group is teaching them a new game, playing sports or helping them with their homework, the time and attention you give them is invaluable. Any skills or talents that any or your entire group have are welcomed. Some days your group might get involved in a more community based aspect such as helping to renovate a classroom, painting part of a child’s home or putting together a sport tournament with the local children. Your group can join the Care project in the Philippines for two or three weeks if you don't have time to join us for four weeks or more. You will gain a valuable cultural insight and work intensely within the local community. However, please be aware that you may not have the same impact as someone or a group participating for a longer period.